If you want to sell your car or van quickly and for a fair price, WeWantAnyCar branch in West Thurrock, Kent will be able to help. We offer simple and hassle-free process and all the help you need while selling your vehicle. Selling your vehicle to WeWantAnyCar is easy - just get your free online valuation first and then book a no-obligation appointment with us. To complete the sale we’ll need vehicle documentation from you, such as V5 and MOT. A complete list of documents needed will be sent to you prior the appointment. If everything is order you are able to sell your car to us on the same day and money will be transferred to your bank account. 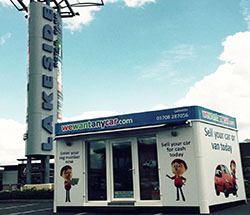 If you have any questions regarding the process get in touch with our friendly team on 01708287056 or email lakeside@wewantanycar.com. You will find our pod in West Thurrock within Lakeside Retail Park which is off A282, just a short drive from Dartford centre and within a walking distance of Chafford Hundred train station. Cant fault the service. Gerard was the person I dealt with. Was on time,very polite. Explained everything clearly but was informal at the same time. Simple process and pleased with the price I received for my car. Would happily recommend to anyone looking to sell their car. Brilliant experience, originally went to webuyanycar and it was awful and they had offered me peanuts for my car. Tried wewantanycar Thurrock Branch (Mark?) and he was very fair and made me feel so comfortable about selling my car with them and I was over the moon with the price they offered me which was even more than my online quote! Was so quick and easy too! No messing around got a good price for my car Wouk recommend to anyone thinking about selling they're car. The service was absolutely 5 star. Gerrard was so helpful, and funny that I really felt at peace selling my car. I also felt like he was on my side and he didn't just feel like a businessman.